The latest issue of CemWeek Magazine is now online! 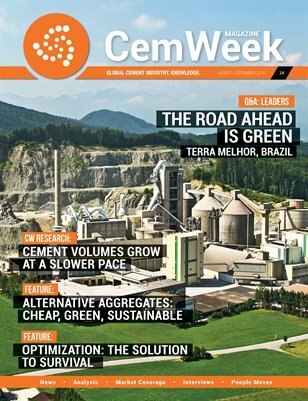 Q&A Leaders: The road ahead is green The first part of an exclusive interview on sustainability and environmental issues in the Brazilian cement sector, with experts from Terra Melhor. From racetrack to road: Inform software Cement producers can learn a lot from the data driven decision making in today’s motorsport. Construction practices and the use of alternate aggregates As aggregates typically make up the majority of the volume of a concrete mixture, it is paramount that producers find cheaper and greener alternatives. CW Research: Global Cement Volume Forecast Report (GCVFR) Global cement volumes are expected to follow the international economic growth slowness, with notable individual exceptions. Product optimization, modernization and technology Product optimization and innovative solutions throughout all phases of production are key to survival in a highly commoditized, competitive business.